Mechanics and auto shops are always looking for an affordable, disposable automotive wipe. Something like the traditional bag of rags, but more cost effective and disposable....those professionals choose TIDDOX's perforated "RAG-ON-A-ROLL", or ROAR. ROAR will clean anything to do with a motor vehicle. Most automotive shops are familiar with bags of rags or the laundered "red rags" that are counted, washed and reused on a regular basis. These roughly textured cloths do a basic job of cleaning the oil off of a dip stick, but if you spill oil? Forget it – red rags are not absorbent enough to do much more than add to your laundry bill. You need an absorbent automotive towel that can stop any spill in its place. How often do you have an oil spill or a radiator leak that spreads greasy antifreeze on the floor, making a bigger and bigger mess? Someone will step in it and track it all over the shop or worse, track it into a vehicle. With ROAR, you have an immediate solution. These are disposable paper workshop wipes that quickly soak up a spill then go in the trash. The perforated rolls are easy to use, but the nylon reinforced cloths are sturdy enough to scrub with. ROAR is made of 4 sheets of wood pulp fabric layered with nylon mesh. 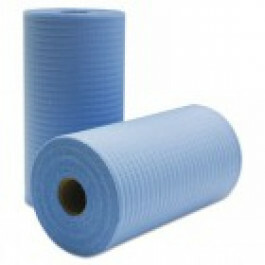 Available in blue or white, Rag-On-A-Roll deserves a place in your automotive cleaning supplies. Try TIDDOX's RAG-ON-A-ROLL as your automotive rags and the red rag will no longer hold its honoured place in your garage. This absorbent, durable automotive wipe is as affordable as it is handy. Give it a try today, and you won’t want to use anything else. Other related products from TIDDOX's automotive range of cleaning wipes are the SOLVENT RESISTANT WIPES, the RHINO WIPES DISPENSER BOX, and the LOW LINT INDUSTRO WIPES.